When placing an order you agree to accept these terms and conditions. Please read them carefully; they may change with or without notice and changes are effective immediately upon being published. Orders can only be processed and shipped when full payment has been received. 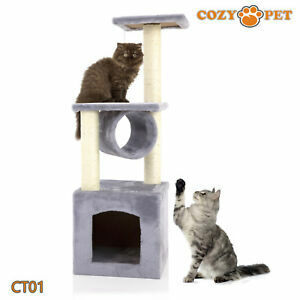 Cozy Pet Ltd reserves the right to cancel any orders and report any un-paid items to EBay which can result in an un-paid item strike. Please check the payment policy on the listing because the Buy It Now policy and Auction Policy may differ. All orders are final and any deposit paid is non-refundable. Upon receiving your item via our carrier you must sign that you accept the item is in good condition; if you feel the item may be damaged in transit you are responsible for informing the carrier and making the driver note any possible damage. Once you have taken delivery of your item you have an additional 24 hours to report to Cozy Pet Ltd any cosmetic or physical damage to your product or any missing parts, that you may not have noticed on delivery. Outside that additional period of 24 hours, Cozy Pet Ltd cannot accept any claims and will not be liable for such damage. Cozy Pet Ltd uses professional photographers to take pictures of its products but from time to time colours may look different from the pictures shown on-line; we are not responsible for slight shade variations. Our pictures are our Copy Right property and may not be reproduced. Cozy Pet Ltd ensures that all of its products go through a rigorous Quality Control process however from time to time parts may be found to be missing or faulty; we reserve the right to replace missing or faulty parts prior to replacing the entire product or accepting a return. Should an item be returned to us because the customer refused delivery or the carrier was unable to make delivery after repeated attempts PCozy Pet Ltd reserves the right to pass a £10.00 carriage charge on to the customer. Cozy Pet Ltd wants to provide you with the best possible products and service and be fully compliant with EBay listing policy, this is why we offer a 30 day money back guarantee. If you are not entirely satisfied with your product for any reason you can return the item to us within 30 days of receipt as long as the item is returned in an unused condition and in its original packaging with no parts missing, marks, scratches or damage of any kind. If there are parts missing or damage to the item we reserve the right to issue a partial refund or refuse the return. Please note that the delivery cost is non-refundable and the buyer is responsible for returning the item back to us (At their own cost), on safe return a refund will be issued within 14 days. Thank you for reading our terms and conditions. Cozy Pet Ltd. Immediate payment of GBP 21.99 is required.